In the first case, you have the choice between MinGW (the Windows port of GNU's GCC) or Microsoft Visual C++. In the second case, you're likely to choose MinGW as many UNIX build facilities expect to find and use it. We'll now suppose you have a vanilla Win32 box, with nothing particular installed, and see how to rapidly setup a working MinGW/C/GTK+3 build environment. 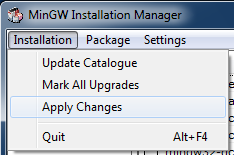 a) Download the MinGW Setup Tool (84,5 Kb). It will ask you for confirmation and take some time to download everything. a) Download the latest all-in-one bundle ZIP archive directly from the official website (here's a direct link for impatients...). We are now ready to compile some code. b) A MSYS console window opens. In it, you're located in the "C:\MinGW\msys\1.0\home\username" directory, where username is the Windows account you're currently using. Copy-paste your source code to this folder.